← What is body mass index? How to choose the correct diet for you? Here is a list of the commonly searched diets. With so many different diets, and with 20,000 books written on this topic of diet and weight loss, it is very confusing for an average consumer to choose what is the best option for them. As a physician trained with a fellowship in this field of obesity medicine, I understand how frustrating, and hopeless some of these choices can be without knowing where to start. Let a professionally trained obesity medicine physician that will accept your health insurance for the visit help you choose the right option for you. It is not just any diet that you want to try but understand the factors contributing to your weight gain such as insulin resistance that affects up to one in three American to the degree of prediabetes, hormonal, nutritional, stress, medications, sleep disorders, genetic, and other factors that cause weight gain and help you start a plan that is right for you. With no setup fees, obligations, mandatory products, and with insurances accepted, W8MD’s unique medical weight loss plan is cheaper than even non-medical programs like Jenny Craig’s. Call 1(800)W8MD-007 to see if you can accepted in our insurance weight loss plan. We get patients from far and near due to the uniqueness of the program. How Can W8MD Medical Weight Loss, sleep and Medspa Center’s Weight Loss Program Help? W8MD Medical Weight Loss Program is for people who are serious about losing weight and gaining control of their health. We understand that losing weight and keeping it off is a challenge for many people and a physician trained in the new field of Obesity Medicine can help. That is why we are committed to our proven approach to medical weight loss using evidence based non surgical methods. We want to give you all the tools you need to succeed in losing weight fast and safe in New York City. If you are a bit overweight or obese and would like to lose weight safely and effectively using proven and evidence based methods instead of fad and unhealthy diets, W8MD’s unique insurance physician weight loss and wellness program might be right for you. Since acceptance is limited to only about 10 new patients a week at this time, call W8MD today at 718-946-5500 to see if you can be accepted in the W8MD’s insurance medical weight loss program. 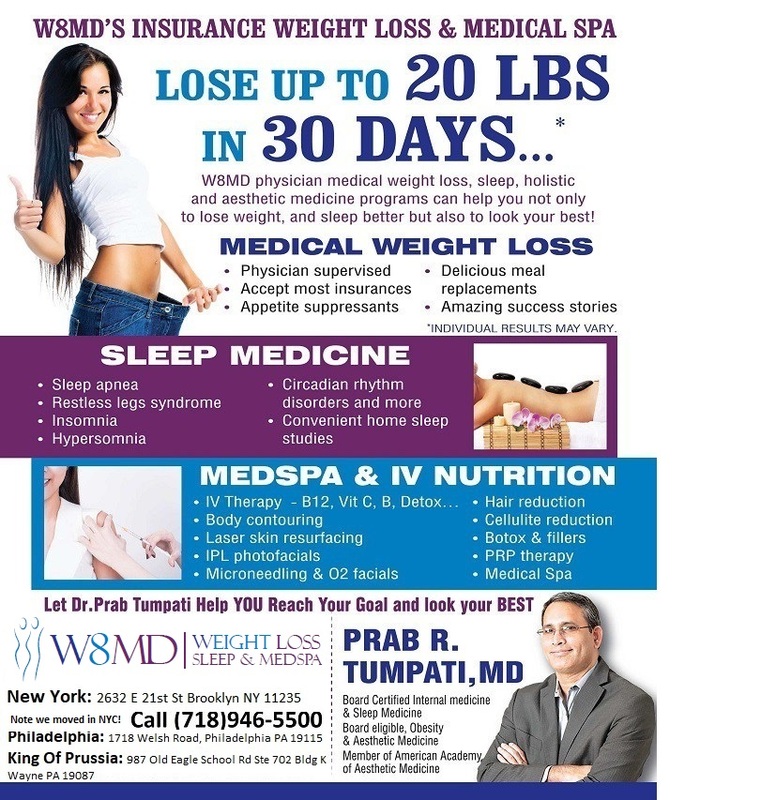 Under the direction of Dr. Prab Tumpati, W8MD Weight Loss Centers unique insurance physician weight loss program can make a difference. Dr. Tumpati has passed a written board examination in the field of Bariatric Medicine and is also Board Certified in Sleep Medicine and Internal Medicine. The doctor’s of W8MD partner with each patient to develop a custom weight management program to best meet their individual needs taking into account their medical history, lifestyle and goals. Sleep disorders and weight gain! Since weight and sleep go together, most of the W8MD centers are able to address sleep issues such as snoring, obstructive sleep apnea, narcolepsy, insomnia and restless leg syndrome to name a few. •ongoing weight maintenance support. We can help you achieve long-lasting weight loss without feeling constantly hungry and deprived. When you resent your weight loss plan because you feel constantly hungry, it is much more difficult to maintain any significant lifelong changes. When you feel hungry, you are biologically driven to eat, and diet plans that force you to fight that biological impulse can be difficult to maintain. At W8MD Medical Weight Loss Program, we want to help you achieve lasting weight loss results and make changes that will keep you healthy for a lifetime. W8MD Medical Weight Loss Program is dedicated to individualized, affordable treatment and as one of the very physician supervised medical weight loss programs to accept most health insurances for the weight loss physician visits. Our non-surgical medical weight loss program is based on the latest medical research and utilizes proven methods to lose weight rapidly and keep it off for a lifetime. Our Medical Director Dr. Prab R. Tumpati is a highly trained and respected physician with training in Obesity Medicine, in addition to being board certified in Internal Medicine and Sleep Medicine, and is well versed in the medical treatment of overweight and obesity. Dr. Tumpati oversees all our patients and helps customize their individual weight loss treatments. We are committed to helping you lose weight as safely and efficiently as possible. Posted on May 23, 2013, in Diet, Diet For Weight Loss, vegan diet, Weight loss and tagged Bariatric, Cabbage soup diet, Grapefruit diet, Health, lemonade diet, Obesity, Shopping, special k diet. Bookmark the permalink. 7 Comments.